Is the title of the exhibition, a warning coming from ‘37 Bedford square’; is the Georgian building talking to us? Is it reminding us it will out-stand us? Or perhaps merely reminiscing about the many people who have walked under its roof, climbed its stairs, passed its walls, walked on its grounds, those who will remember it forever more.Context is being challenged; is the building containing us or are we containing the building?We pass through two seemingly disparate scenes: an image of the building holding us, a solid interior on the south wall that in its self-reflexivity renews the challenge of context, and facing it on the north wall, a lightweight house, an outdoor house; a tree house. On the one side, an interior devoid of people yet familiarly holding us, the spectators, and on the other side a house only recognisable by the people it holds. One Georgian, one of present-day Gujarat; One standing for over two hundred years, one being replaced repeatedly since way before that.Is there a point where these two remote spaces connect, relate, draw close? To find the answer, I’d like to go back to the title; where the displacement of context suggested is made possible through passing. The title seems to suggest that the possible collision can only be evident in time and in relation to context. 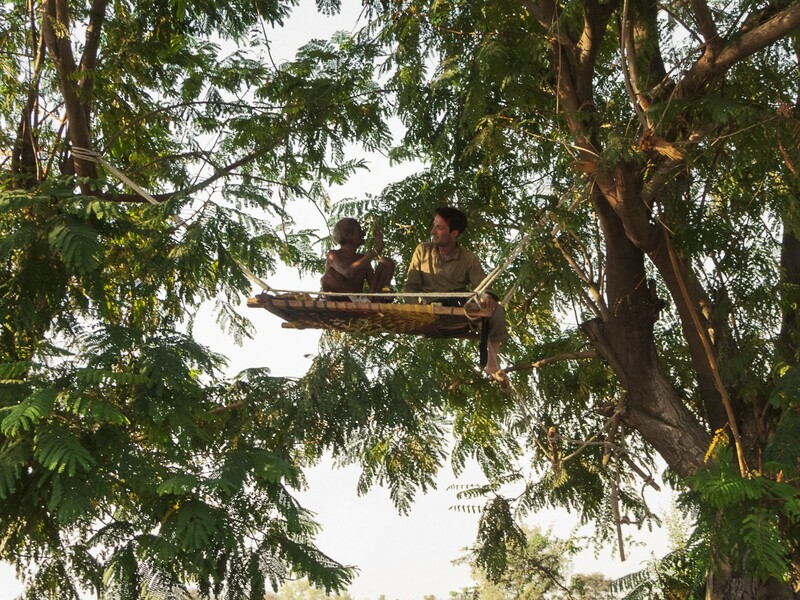 Of course, one possible collision is the present, where the Georgian building has become the context of the tree house, the other perhaps Georgian British India where the skies and grounds of the tree house were context. What is passing through me, I pass through it (2009-), is an instalment of an ongoing project, Untameable is the Wind, initiated by Kiril Kuzmanov in 2008, the first part of which came to a close in April 2010: an eleven-month journey on land, passing through remote areas in Turkey, Kyrgyz Republic, Republic of Kazakhstan, Russian Federation, Altai Republic, Mongolia, China, Tibet, Nepal, Kingdom Lo Mantang, India and Kashmir.